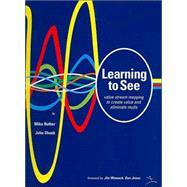 Mike Rother and John Shook’s book Learning to see is perhaps one of the most well known books on Value Stream Mapping. From Shooks time at Toyota, where he noticed the process being used – the book utilizes a series of workbook style examples to help take the reader through the construction process of a value stream map and how it is applied within a lean environment..
“Learning to see” is so often cited by Lean practitioners that it’s become a staple for anyone looking to start working with VSM’s – and you’ll certainly see consultants using it as a study guide. •	Achieving the future state. Laying the book out in this structure is a great idea as many companies will go through this route in their value stream programs and in particular many will benefit from the chapter on what makes the value stream lean. Undoubtedly this is one of the most challenging aspects of re-engineering a process and Rother and Shook offer some great insight into how this can be achieved. Given the author’s pedigree they are able to translate the concept into reality by using examples in industry of how and where value stream mapping can be used. Be aware though the book is heavy on the manufacturing side and you might want to consider some supplementary material if your looking at the service industry. However as it stands Learning to see remains an important part of any lean practitioners toolkit. Can you show some example Value stream maps for inspiration? Were can I get Value stream mapping icons for visio?